Crossing the banks of the Neretva River, the Stari Most has quite a tragic past. It was largely destroyed by Croatian forces during fighting back in 1993 after having stood in the same spot for more than 400 years. It was reconstructed after the war and reopened in 2004. The original bridge was designed by Mimar Sinan and is a fine example of Islamic architecture from the Ottoman period. Sin años other works include some of the finest mosques in Turkey and the Wailing Wall in Jerusalem. He even had his design concepts incorporated in the construction of the Taj Mahal. The bridge and the Old Town of Mostar in which it stands are UNESCO World Heritage sites. Half bridge, half shopping centre, this medieval stone bridge spans the Arno River in the historic Italian city of Florence. Characterised by its three main arches, this is the only bridge in Florence that the Nazis didn’t destroy. It was alleged that Hitler thought it too pretty. Let’s face it, that might be the only decent decision the man ever made. Anyway, it’s a gorgeous bridge to take a walk along. It houses a host of pretty stores selling high-end jewellery and various trinkets. As seems to happen along many bridges, visitors began attaching padlocks to the structure, but these have been removed. It’s also one of the oldest of all European bridges. Built in the 13th Century, the bridge spans the Otava River. The bridge was damaged in severe flooding back in 2002 but has since been reinforced with iron and concrete. I sometimes forget about this bridge. This is because I’m Scottish and I’m so accustomed to seeing it, I take it for granted. It’s been voted Scotland’s best man-made wonder. The Forth Rail Bridge is a UNESCO World Heritage Site. When opened in 1890, it was the world’s longest cantilever bridge and the first major crossing constructed entirely from steel. The bridge spans 1.5 miles across the Forth and is often lit up in different colours at night. Translating to English as ‘New Bridge’, this stone structure is the oldest bridge spanning the River Seine in Paris. Pont Neuf straddles western part of the Ile de la cite; the island housing Notre Dame Cathedral. The bridge was destroyed during the French Revolution and was rebuilt from previous casts to the same design. The structure features a statue of Henry IV on his horse, along with 61 alarmingly mean looking masks. This is one of six bridges spanning the Douro River in the Portuguese city of Porto, but is easily the most iconic of the bunch. The bridge has a double deck, with cars and buses running along the lower tier. Pedestrians and trains have sole use of the top level, which offers amazing views up and down the river. The bridge has connected Porto with the city of Vila Nova de Gaia since 1886. There are three bridges spanning the Bosphorus River in the city of Istanbul, which officially connects the continents of Asia and Europe. The Bosphorus had the honour of being the longest suspension bridge in Asia until the Sultan Mehmet was built over the same stretch of water in 1998. It was also the longest bridge in Europe until the Humber was erected in England in 1981. It may lack records, but it does have an impressive range of lights which sparkle in the night sky. Sitting over the River Tagus in the Portuguese city of Lisbon, the Vasco da Gama is the longest bridge in Europe. The Vasco da Gama was completed in 1998, making it the youngest European bridge on the list. The bridge holds six lanes of traffic and curves off from the bay in Lisbon and into the Tagus River. Constructed to allow traffic to circumnavigate the city centre, the bridge stretches for more than 7.5 miles across the Tagus. There’s a hotel on the banks of the River where you can view the bridge while enjoying wine. This has absolutely nothing to do with this post, but I thought you should know. Useless information? You’re welcome. 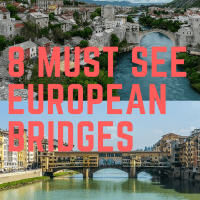 Do you have any other must-see European bridges to add to the list? *author might be slightly biased.